The modern world has changed the way customers research, interact with, and buy from companies. The accelerated process has made it crucial to supply a proper customer journey. In order to manage customer journeys appropriately, companies need to deliver their customers the right messaging, at the right moment, on the right platform. Achieving the right balance can seem like an overwhelming task, but you’ll thank yourself for it later, especially since customer journeys impact retention and churn. But, having only one successful customer touchpoint doesn’t guarantee overall customer satisfaction. Customer journeys take into consideration each customer's historical interactions and their current stage of the journey. Customer retention begins with onboarding and (hopefully!) ends in renewal. However, that isn’t always the case. End-to-end journey management is one of the ways of moving customers along their path. 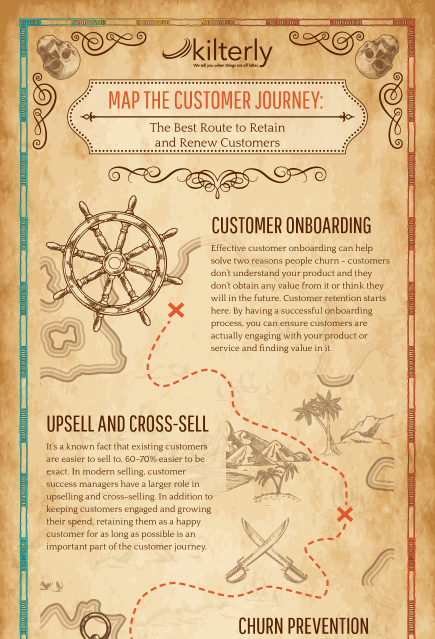 Take a look at how mapping out their customer journey can help you prevent churn and get them to retain and renew.